Dilue Rose Harris. Courtesy of the Houston Chronicle. Image available on the Internet and included in accordance with Title 17 U.S.C. Section 107. 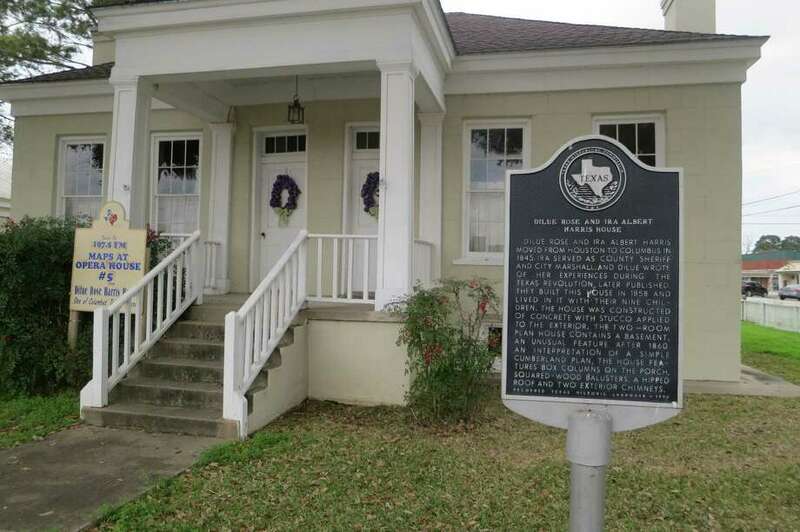 Dilue Harris's House and Historical Marker. Courtesy of the Houston Chronicle. Image available on the Internet and included in accordance with Title 17 U.S.C. Section 107. HARRIS, DILUE ROSE (1825–1914). Dilue Rose Harris, pioneer and memoirist, the daughter of Dr. Pleasant W. and Margaret (Wells) Rose, was born in St. Louis, Missouri, on February 28, 1825. The family arrived in Texas in April 1833, stopped temporarily at Harrisburg, and settled at Stafford's Point in December of that year. Dilue Harris made bullets for men going to the Alamo and took part in the Runaway Scrape. After the Texas Revolution the family moved to the area of Bray's Bayou five miles outside of Houston. There Dilue attended school. 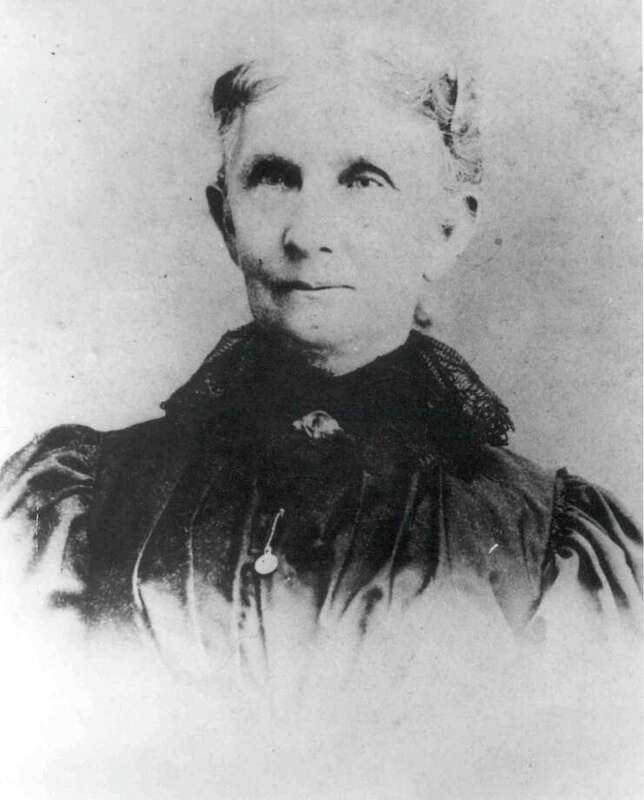 She was married on February 20, 1839, to Ira A. Harris, who was born in Jefferson County, New York, in 1816, arrived in Texas in 1836, and served with the Texas Rangers, Company E. The couple lived in Houston until 1845, when they moved to Columbus. Their Houston home in the 1990s had a historic marker. Harris died in 1869 and was survived by his wife and nine children. Dilue Harris was acquainted with the leaders of the Texas Revolution and of the Republic of Texas, and her reminiscences, written when she was seventy-four and published in the Quarterly of the Texas State Historical Association (see SOUTHWESTERN HISTORICAL QUARTERLY) and the Eagle Lake Headlight, are a primary source for early Texas history. At one time Mrs. Harris lived with a son, William Lee Harris, in Purcell, Oklahoma Territory. She died at Eagle Lake, Texas, on April 2, 1914. Evelyn M. Carrington, ed., Women in Early Texas (Austin: Pemberton Press, 1975). George L. Charlton, "Vince's Bridge: Question Mark of the San Jacinto Campaign," Southwestern Historical Quarterly 68 (January 1965). Ann Fears Crawford and Crystal Sasse Ragsdale, Women in Texas (Burnet, Texas: Eakin Press, 1982). Houston Chronicle, April 3, 1914. Houston Post, April 4, 1914. Adele B. Looscan, "Harris County, 1822–1845," Southwestern Historical Quarterly 18–19 (October 1914-July 1915). "Reminiscences of Mrs. Dilue Harris," Quarterly of the Texas State Historical Association 4, 7 (October 1900, January 1901, January 1904). Vertical Files, Dolph Briscoe Center for American History, University of Texas at Austin. Handbook of Texas Online, Herbert H. Lang, "HARRIS, DILUE ROSE," accessed April 24, 2019, http://www.tshaonline.org/handbook/online/articles/fha89.